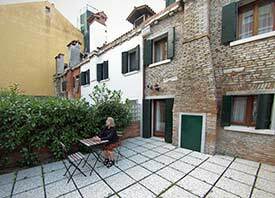 The Alloggi Marinella is on a quiet neighborhood street within a short walk of the People Mover, airport buses, and taxis in Venice's busy Piazzale Roma. We think it's a delightful place to stay (see our review), especially if you book a superior double room with patio like the one in the photo above. Turn right at the next street, the tree-lined Rio Terà dei Pensieri. The Alloggi Marinella is just down the street on the left. Look for a yellow building with an oval hanging sign. For a video preview of your walk, click below.